The tulips are pink this year! Yesterday we had a planter full of green tulip buds with only one flower open - a beautiful pink one. This morning this is the view from my window. It is glorious to finally have spring arrive - it is just erupting everywhere you look. It's always a surprise to see the "color of the year." The tulip bulbs are planted by an organization (unknown to me) and each year the little plants just appear. It has taken more than a month from first sighting to blooming. I sketched and painted the full planter from my window, but took a milk crate, my pen, and my palette of watercolor paints to the sidewalk to draw the individual plant. Many families and single pedestrians on cell phones walked by during the time I was there and there was not a single comment. New Yorkers don't find anything strange! The tree in the planter still has no buds, but we have flowering trees at window level in all directions. I joined the EDM group in September and slowly worked through earlier challenges using Pigma micron pens. 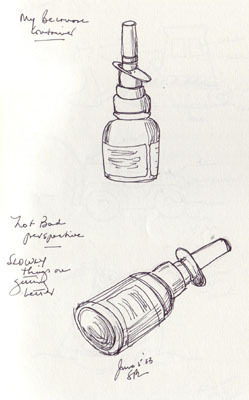 In December, I pledged to myself to do a daily ink/watercolor wash drawing every day during 2006. 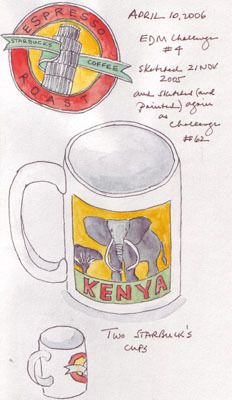 For challenge #62 I decided to repeat my sketch of mugs - and to add a watercolor wash because I'm not ready yet to move beyond these pens and my limited watercolor palette. The perspective is still wonky and I continue to wonder "Why are circles and ovals so hard for me to draw?" 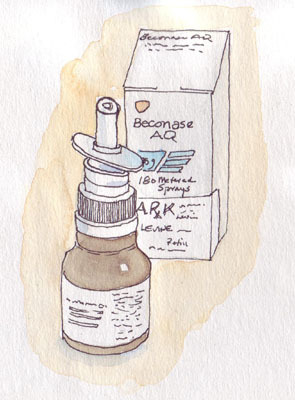 My springtime allergies are bothering me, so I sketched my steroid nasal spray medication yesterday. 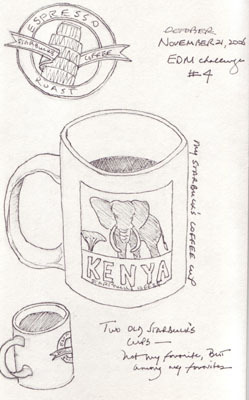 Then I remembered that I sketched it almost 3 years ago when I was drawing only occasionally. It was fun to compare the two journal pages and realize that I now add a watercolor wash to every sketch - adding color has become a really important part of every journal entry. Yesterday was a beautiful day in New York City and everyone was outside enjoying the early spring weather. Central Park was full- many ball games, bike riders, walkers, runners, sun bathers and just plain folks sitting on the benches. There were several beds of daffodils at the park entrance on E 86th Street and I stopped to sketch a few while I was walking with my granddaughter in her stroller. 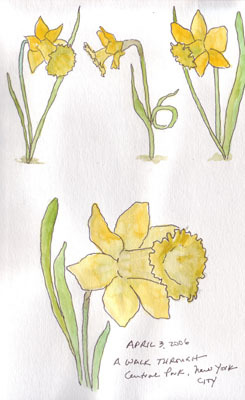 I was delighted to see the EDM challenge for this week because I already had my grouping of 4 different daffodils and just needed to finish painting them today. Within the next 2 weeks there will be many beds of tulips in bloom as spring definitely arrives in the Northeast. 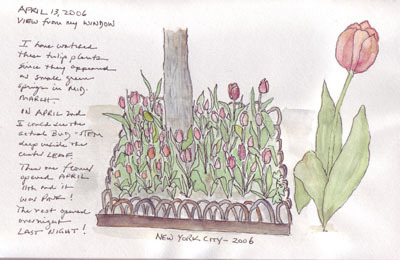 I'm watching and periodically sketching one specific tulip plant that is growing in a flower bed in front of my building. I can't wait to see what color it is! This daffodil painting was going to be one of my series of Color projects since I'm exploring YELLOW this month. Now there will be one less to add at the end of the month. 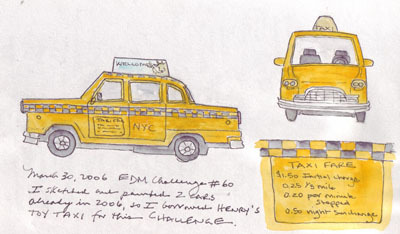 I sketched and painted cars twice already in 2006, so for this challenge I decided to use my Grandson Henry's toy New York City checker cab. Since I will soon start my yellow month, as part of the Color Project that I am doing, it was exciting to get an early start.